Solar maximum is now. Indeed, the maximum — the peak of the 11-year sunspot cycle, when the sun erupts with solar flares and energetic bursts of electrons and protons — may have already passed. But neither does it rival a quiet period in the second half of the 1600s that coincided with the onset of the Little Ice Age, a prolonged chill in Europe. 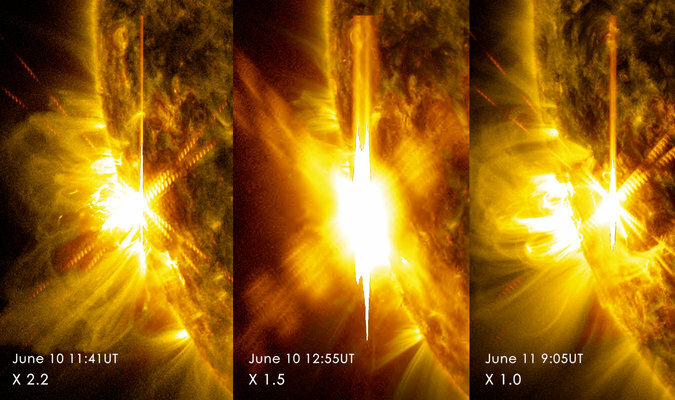 The sun erupted with several giant solar flares last month but has been mostly quiet the past two weeks. “I think the general consensus is that we’ve passed the peak,” said C. Alex Young, a solar astrophysicist at NASA’s Goddard Space Flight Center in Greenbelt, Md. But he added that some of the biggest solar storms in history occurred on the downward side of the solar cycle, and even a weak cycle can generate ferocious outbursts. Perhaps more than anything else, the current maximum has taught solar scientists that they have a lot more to learn about the sun. In 2006, at the end of the previous solar cycle, Mausumi Dikpati, a scientist at the National Center for Atmospheric Research in Boulder, Colo., undertook an ambitious endeavor — a computer model using the basic physics of the sun to forecast what would happen next. Her model made two main predictions: The cycle would start slowly, and it would be a big one, one-third to one-half stronger than the last one. Her first prediction came to pass. The lull stretched for four more years, leading to some speculation that the sun was on the cusp of another Maunder Minimum, the sunspotless era of the 1600s. But her second prediction was wrong.